The U.S. Air Force has tapped the Delta 4 as its rocket of choice to launch the fourth Wideband Global SATCOM spacecraft two years from now, officials announced Monday. Liftoff of the WGS 4 communications satellite from Cape Canaveral is targeted to occur between December 2011 and February 2012. 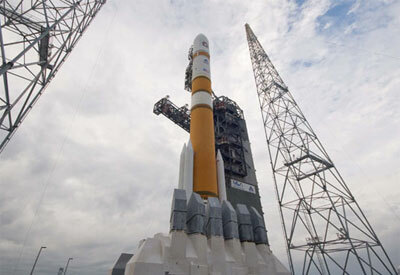 The contract award comes just a month after the successful launch of WGS 3 atop a Delta 4 rocket. See our coverage of that flight here. A powerful version of the United Launch Alliance-built Delta 4 is used to carry these sophisticated payloads into geosynchronous transfer orbit. The specific rocket configuration is known as the Medium+ (5,4), which is distinguished by a five-meter composite payload shroud, a similarly-sized cryogenic upper stage and four solid-fuel boosters strapped to the first stage. "Following the launch of WGS 3, United Launch Alliance is proud to continue our vital role in providing the latest technology for the warfighter with this contract for the fourth launch of a WGS spacecraft," said Michael Gass, ULA's president and chief executive officer. The WGS satellites supply communications such as maps and data to soldiers on the battlefield, relay video from unmanned aerial reconnaissance drones, route voice calls and data messaging, and even offer quality-of-life considerations like television broadcasts and email delivery to the troops. The first two spacecraft in the series were launched by ULA's Atlas 5 rockets in October 2007 and April 2009. WGS 1 covers the vast Pacific Command that stretches from the U.S. western coast all the way to Southeast Asia; WGS 2 was placed into operation over the Indian Ocean for use by U.S. Central Command to provide coverage for the warfighters in Afghanistan, Iraq and other parts of Southwest Asia. The new WGS 3 satellite launched on December 5 is undergoing orbital maneuvers and testing. It will be positioned above the Eastern Atlantic with a broad reach to cover U.S. European Command and U.S. Africa Command, plus lend additional support over the Middle East. Boeing produces the WGS satellites for the U.S. military. The company has WGS 4, 5 and 6 under construction for deployment in the coming years. Each WGS bird has 10 times the capacity of the aging Defense Satellite Communications System spacecraft that they are slated to replace. "The WGS constellation was the first series of satellites to launch on both the Atlas 5 and Delta 4 launch vehicles since the inception of ULA. This operational flexibility for our government customers was a primary reason for the creation of ULA," Gass said. ULA was formed in December 2006 to combined Boeing's Delta and Lockheed Martin's Atlas fleets of rockets under a single organization to streamline launch services for the U.S. government. The Denver-based firm has launched 37 missions to date, all successfully, including 22 Delta 2s, 11 Atlas 5s and 4 Delta 4s.